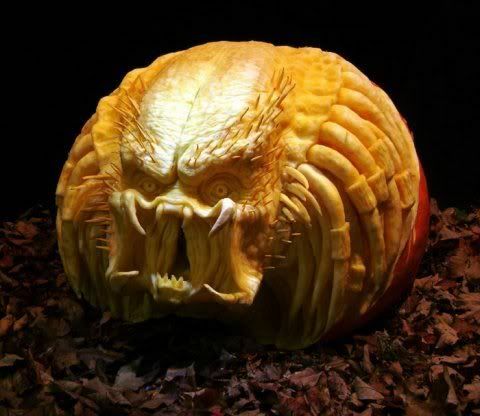 I must say, this pumpkin predator is probably one of the most detailed "scary" pumpkins I've seen before. Want even more detailed pumpkin carvings? Try out Pumpkin Gutter for tons of gallery photos. Extreme Pumpkins also has some interesting ones, although the general theme seems to be creative setups or quirky carvings, rather than overly detailed and artistic. I recognized it right away, this is the "Predator" from the Arnold Schwartzenegger movie of the same name (the second one with Danny Glover was just as good in my opinion, if not better). I have seen this movie. I think this the great art. I will check it out of it's tutorial soon.